A big part of Strategas' argument stems from the fact that the period against which current earnings are compared — the first half of 2016 — was notably weak. And that, in turn, pushed year-over-year growth to unsustainable levels. As the chart below shows, Wall Street is not bracing for the decline. Its estimates are represented by the blue columns, which show continued profit expansion over the next two quarters. Strategas has other ideas. 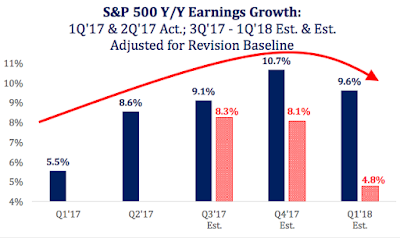 Adjusting for historical factors, the firm sees earnings growth declining over the period before being cut almost in half by the first quarter of 2018, as indicated by the red columns. 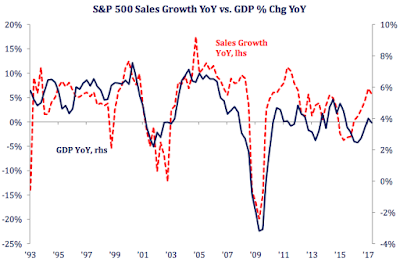 In addition, Strategas believes that sales growth appears "toppy". (1) S+P 500 forward revenues per share, which tends to be a weekly coincident indicator of actual earnings, continued its linear ascent into record-high territory through the week of August 10. (2) S+P 500 forward operating earnings per share, which works well as a 52-week leading indicator of four-quarter-trailing operating earnings, has gone vertical since March 2016. It works great during economic expansions, but terribly during recessions. 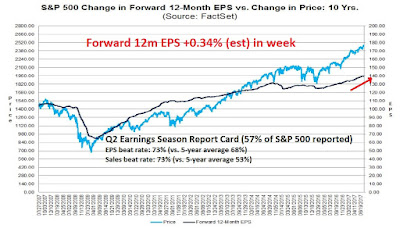 If there is no recession in sight, then the prediction of this indicator is that four-quarter-trailing earnings per share is heading from $126 currently (through Q2) to $140 over the next four quarters. Yardeni's believes that there is little risk to stock prices, as long as forward 12-month EPS and revenues are rising. What`s going on? How do investors reconcile the two contradictory conclusions of analysis of the same data set? Q: What's George W. Bush position on Roe vs. Wade? A: He doesn't care how people get out of New Orleans after Katrina. Judie stayed, she tells me, because she had no means to leave and no place to go. 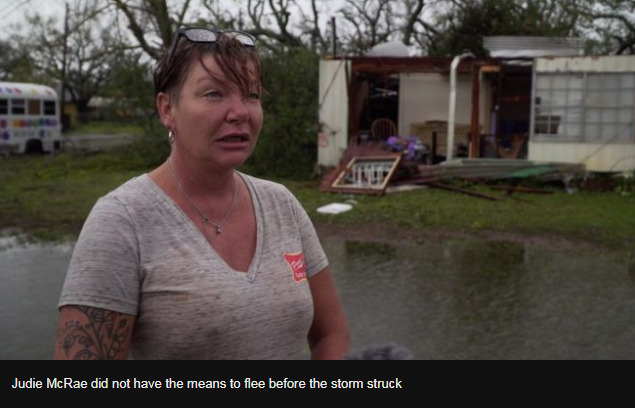 "I had some problems getting out of town, a little broke and stuff, so I had to come home and, you know, tough it out," she says. "We're all the working class people. "We're the ones who go to the restaurants and wait on you and pick up your trash and do all that work. We don't have a lot of money." "Fighting for the American dream," she adds, with a rueful laugh. Hurricane Harvey may prove to be a significant stress test for both the American economy and the Federal Reserve. 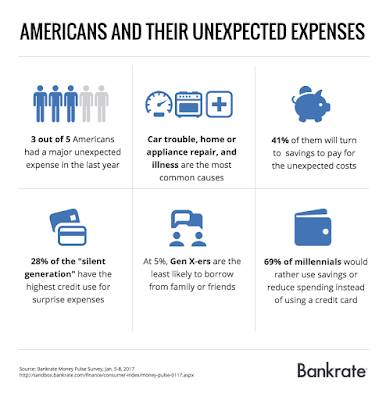 A recent Bankrate survey indicated that only roughly 4 in 10 Americans have sufficient savings to cope in an emergency, which is indicative of the low margin of financial error that the household sector operates under. Is the Fed tightening into a stalling economy? But if not market valuations what should be the focus on investors? My view is that they should be watching for signs that, at a minimum, earnings growth will falter or, probably more importantly, that the economy is set to tip into recession. I tend to think it is more likely that the economy takes the equity market down with it than the opposite. To be sure, it is impossible to know that the future holds. The chaotic environment in Washington, for example, could erupt into a crisis than threatens the economy. A more likely scenario is that the time will come -- as it always has -- when the Fed tightens policy too much and reverses itself too slowly. That is the most likely event that brings down the economy and equity markets. We just aren’t near that point yet. I beg to differ. There are early signs that the American economy is starting to stall. These indications, if viewed from a standalone basis, are not cause for concern. But combined with the Fed`s resolve to normalize monetary policy, current conditions could become the basis for a monetary policy error that tips the economy into recession. Mid-week market update: As the stock market staged a bounce yesterday, it was still exhibiting a pattern of lower highs and lower lows. After the close, the market ran into a dose of Trumponomics that spooked the market and pushed the index below its 50 day moving average. Notwithstanding Trump's fiery rhetoric about Charlottesville and immigration policy, which are beyond the scope of this publication, two details of his speech served to tank the market. First, his threat to shut down the government by holding up debt ceiling negotiations if his Wall was not funded did not do the bulls any favors. As well, his comment of "I don't think we can make a deal", when referring to NAFTA raised the specter of tariff walls. 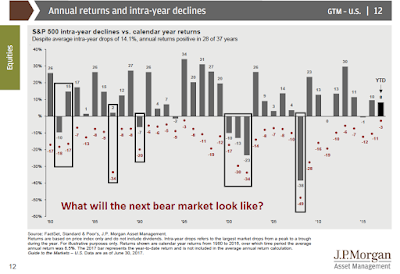 What will the next bear market look like? Recently, Lawrence Hamtil of Fortune Financial wrote an article entitled "Imagining the next bear market (with examples from the last two)". He analyzed the effects of sector performance, large and small cap returns, asset correlations, and other characteristics of the last two two equity bears. While that kind of analysis represents a good starting point, we know that history doesn't repeat, but rhymes. With that in mind, here is an examination of the stress points of the next bear market, based on the assumption that it is sparked by a recession. My main focus estimating equity downside risk. 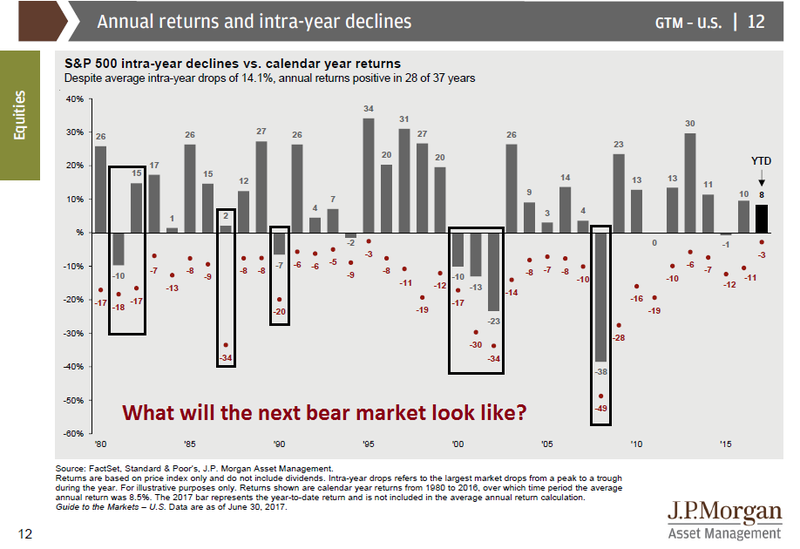 What will the next bear market look like (chart bars =annual returns, dots=annual drawdowns)? Will the recession be mild (1990), or long and protracted (1980-82, 2000-02)? Will the market crash? If so, will it be accompanied by a recession (2008) or not (1987)? Recessions are periods when the excesses of the past expansions are unwound. Arguably, there have been few excesses in the current expansion except for the proliferation of Silicon Valley unicorns. That argues for a shallow bear market with a drawdown in the order of 20%, such as 1990. On the other hand, the excesses have occurred outside the US (see Looking for froth in the wrong places), which makes the case for higher losses if the economic downturn is global. The answer can be found by analyzing the fault lines of the economy today for clues of how the next recession might develop. 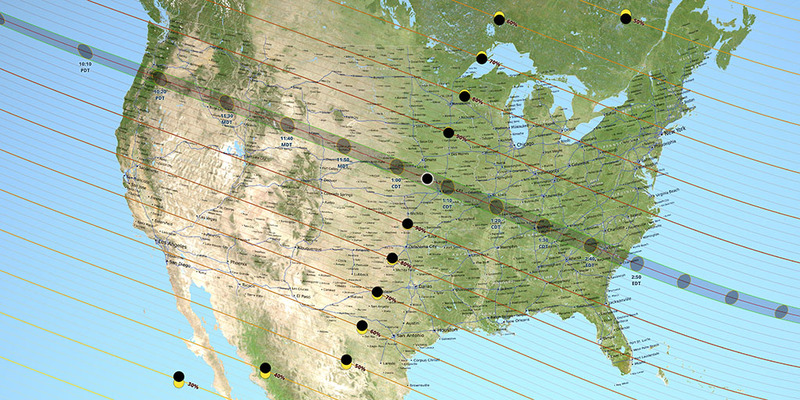 I will be off for a few days in Oregon, where I will (hopefully) observe the Great American Eclipse of 2017. 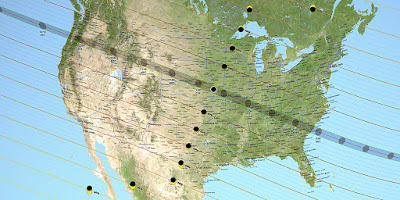 The regular weekend commentary will continue to be published, but posting will be lighter than usual as internet access is expected to be spotty. Before I leave, I leave you with a summer reading list. I have been asked in the past to suggest books on how to invest and trade. My answers are a bit more offbeat than the usual recommendations to read Market Wizards, The New Market Wizards, or Fidelity Low-Price Stock PM Joel Tillinghast's book, Big Money Thinks Small (see Barron's interview). The purpose of this site is to teach readers how to fish. No book is going to make you the next Warren Buffett or Paul Tudor Jones. I am going to make you work and expend some effort to catch your fish in your reading. Let`s start with the basics. 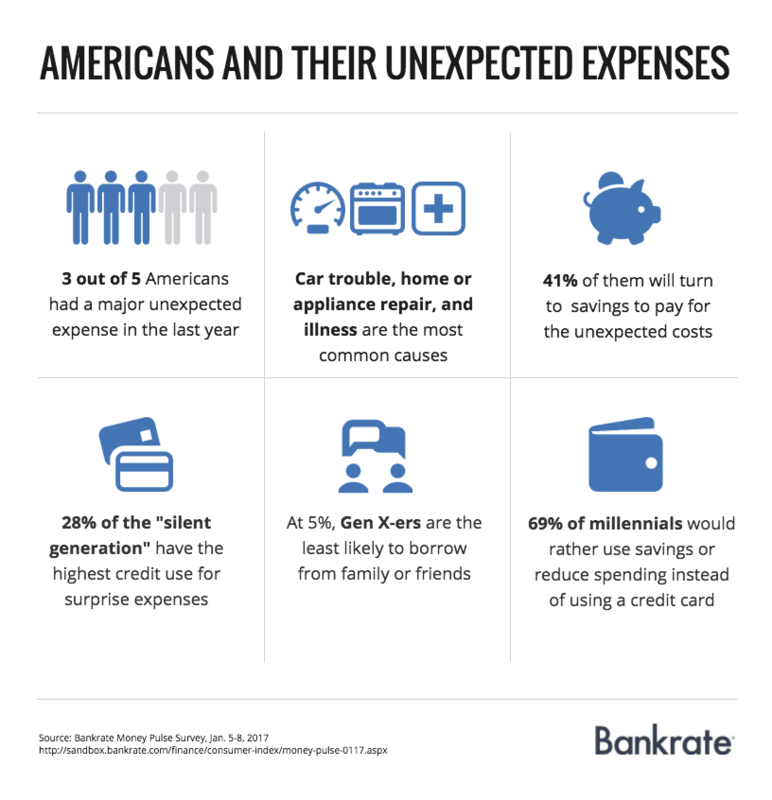 Even before thinking about investing, consider the basics of financial literacy and why you need a financial plan. Here are some blog posts of value, including some old posts of my own. Freakonomics: Everything you wanted to know about money (but were afraid to ask). Can you correctly answer three basic financial literacy questions? If not, you should start with the 10 things you need to know about investing that fit on an index card. Humble Student of the Markets: The ABCs of financial planning. Do you have an Investment Policy Statement? If not, how will you know where you are going if you don't have an objective? Put simply, if the term investment plan sounds overly intimidating, think of it as a savings plan. Humble Student of the Markets: Investment policy: Not just for pension funds. Once you have figured out where you are going, here is an example from CALPERS on how to create an investment road map. A Wealth of Common Sense: Thinking through a change in asset allocation. Once you have an investment plan, Ben Carlson goes through on how to create a process on thinking through changes. A Wealth of Common Sense: Reframing the concept of risk. Risk is everywhere. Carlson puts it very simply, "Don't over-react to events." For a primer on corporate strategy, there is no better place to start than with Michael Porter. Porter is known as the guru of corporate strategy. His books Competitive Advantage and Competitive Strategy are must-reads and taught in virtually all B-School programs. However, Porter acknowledged that his list of competitive advantages, however, are static advantages and shifts can occur. He evolved by detailing how the shifts occur at a macro level in The Competitive Advantage of Nations. For investors interested in how disruptions happens, Blue Ocean Strategy represents a newer line of thinking in corporate strategy. Authors W. Chan Kim and Renée Mauborgne argue that companies can succeed by creating "blue oceans" of uncontested market space, as opposed to "red oceans" where competitors fight for dominance, the analogy being that an ocean full of vicious competition turns red with blood. They assert that these strategic moves create a leap in value for the company, its buyers, and its employees while unlocking new demand and making the competition irrelevant. The book presents analytical frameworks and tools to foster an organization's ability to systematically create and capture blue oceans (via Wikipedia). Do you want to find undervalued companies and takeover candidates? Try this useful handbook of how companies work financially: Best-Practice EVA: The Definitive Guide to Measuring and Maximizing Shareholder Value. The book is an eye opener and details how companies add shareholder value. More importantly, the Economic Value-Added (EVA) framework details where the cash flow goes in a company. In turn, it lends to an understanding of corporate restructuring process by private equity investors. In the process, investors can discover hidden gems and takeover candidates where private market value exceeds publicly listed value. Regular readers know that I have a global big picture macro focus. Here are some important books that have formed my views of how societies develop. Unless you understand the development process, you won't be able to construct an analytical framework and react properly when shocks like the Great Financial Crisis, or the Asian Crisis occur. The Competitive Advantage of Nations. Michael Porter lays out how countries go through the stages of development, and the kinds of policies that work at each stage of growth. The Economy of Cities and Cities and the Wealth of Nations: Principles of Economic Life. Jane Jacobs was a leading researcher in how cities develop. Jacobs' views on development are very similar to Porter's, except that her unit of development is the city-state, instead of country, which is Porter's framework. Finally, we get to the good stuff (for traders)! I am going to disappoint many readers here. There is no magic black box to trading. Everyone has to develop their own style. Books like Market Wizards will not instantly make anyone a better trader. Instead, I have suggested to readers that they enroll in the Charter Market Technician program. Start by learning the basic body of knowledge, then develop your own style. That said, here are some examples of books written by a couple of readers that undertaken their own journey of market analysis. Authors Dave Harder, portfolio manager, and Janice Dorn, a psychologist, have put together a book that combines human psychology with market analysis. The book has received positive reviews from the likes of James P. O’Shaughnessy, money manager and author of What Works on Wall Street, Predicting the Markets of Tomorrow, How to Retire Rich, and Invest Like the Best; Robert McTamaney, Former Partner and Head of Trading, Goldman Sachs Asia; Robert Sluymer, Technical Analyst, RBC Capital Markets; and John Gray, Editor, Investors Intelligence. 'The Pathway - Your money ... in a changing world' tells why Momentum-style investing is the best strategy to navigate the new factors, with unknowable outcomes, affecting financial markets today: the digital revolution, globalization, new Central Bank policies like negative interest rates, Middle East politics, Donald Trump, to name a few. Momentum points you mathematically to the winning sectors and companies while as importantly, avoiding the casualties. You are also given the tools to invest; customized momentum charts of over 500 industry ETFs and the largest companies in them. These are dynamically linked to the internet and update automatically when viewed. These are just some samples of journeys that others have taken. The CMT program as a good way of learning the basics, and then you can find your own path. Regular programming will resume next week. Please keep everything together while I step out (and, please, don't shoot any Archdukes while I am gone). Mid-week market update: Last Friday, subscribers received an email alert indicating that the trading model had flipped from short to long. In my weekend commentary (see "Fire and Fury" is hard) that my inner trader expected "the time horizon of that trade to be not much more than a week." I am reminded of the Trooper song, "We're here for a good time, not a long time" when referring to this trade. On one hand, the relief rally has been impressive. Both my VIX model and Zweig Breadth Thrust Indicator had flashed deeply oversold conditions (see Three bottom spotting techniques for traders). If history is any guide, the duration of the rally should last, at a minimum, until Friday or Monday. On the other hand, breadth indicators are not showing the bulls any love. The chart below shows negative divergences in credit market risk appetite, % bullish, % above 50 and 200 dma, In particular, the latter three indicators are exhibiting bearish patterns of lower lows and lower highs. 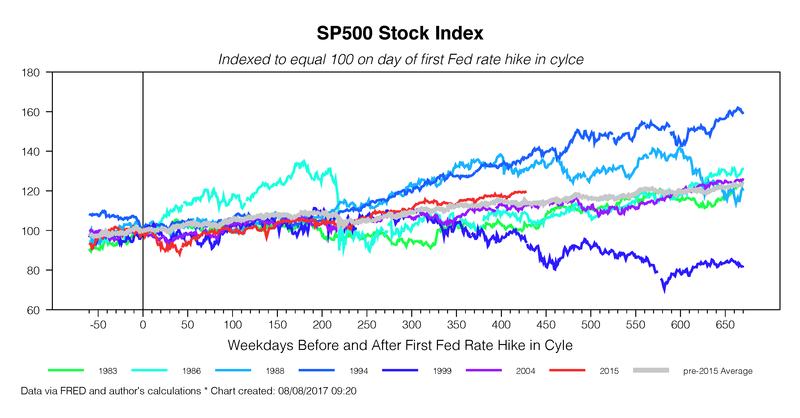 Looking into September, the stock market faces a number of macro headwinds that could serve to further depress prices. President Donald Trump has achieved few major legislative victories in his six month presidency, despite the Republican majority in both the Senate and House. One disappointment was the failure of the Republicans to repeal Obamacare because of disagreements between different wings of the GOP. Trump has learned that "healthcare is hard". Similarly, "tax reform is hard". By design, American government was built on a system of checks and balances. While Trump's legislative initiatives may be held up by Congressional dissension, the President has far fewer constraints in the conduct of trade policy, foreign policy, and military affairs. In particular, he can do more or less what he wants without Congressional oversight when it comes to his role as Commander-in-Chief of the American military. As the markets are gone risk-off in light of Trump's "fire and fury" comment about North Korea, I am going to depart from the usual economic and market analysis this week and focus on the question of the constraints on President Trump in a conflict with North Korea. To be sure, the markets are showing a high degree of fear that war could break out on the Korean peninsula. 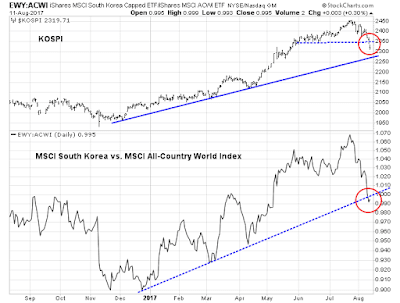 Past scares has seen little reaction from the Korean Won (KRW) or Korean equities. 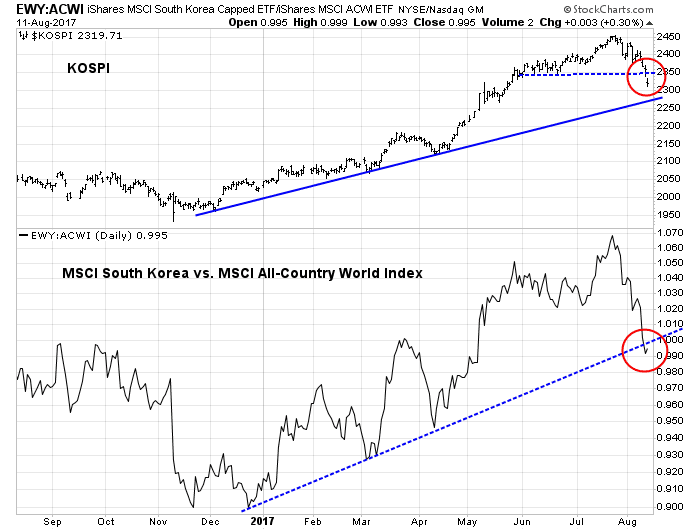 This time, South Korean stocks are tanking, both on an absolute basis and relative to global stocks. Investors should relax. As Donald Trump is about to find out, "War is hard too". Mid-week market update: Narrow trading ranges are often technical signs of sideways consolidation, followed by further upside. In this case, bulls are likely to be disappointed, as market internals point to a correction ahead. The Nikkei tumbled 15 per cent on its “Black Tuesday” in the wake of Wall Street’s violent collapse and lost a further 5 per cent before global markets regained their feet in mid-November. Yet, even though the crash knocked $500bn off corporate Japan’s market value, Tokyo’s fall was mild compared with those in the US, Europe and elsewhere in Asia – where some bourses plunged as much as 40 per cent. By the spring of 1988 the Nikkei was back up to a 15-year high, from which it would continue soaring for another 20 months. “I don’t remember anybody in the office panicking,” Soichiro Monji says of the turbulent weeks that followed the October crash. Mr Monji, then a dealer at Daiwa Securities, Japan’s second-biggest brokerage house, now plans equity strategy at the group’s asset management arm. Daiwa and Japan’s other big brokers were in any case sitting tight, having been ordered by their regulators in the Finance Ministry not to sell into the panic – an act of intervention that “would be inconceivable today”, notes Mr Monji. Kiichi Miyazawa, the finance minister and later prime minister, who died earlier this year, told all who would listen that calm would soon return. The government’s tactics helped stem the Nikkei’s fall, although a rosy growth outlook, low interest rates and a rising yen probably played a bigger role. The market’s structure helped: two-thirds of all company shares were held not by profit-seeking investors but by allied companies seeking to cement business ties. In many ways, the panic was arrested in Japan and saved the world, but it paid a price later in that decade when the Japanese market collapsed and began the Lost Decades. Fast forward to the Great Financial Crisis of 2008. The Chinese authorities ordered the banks to lend, and local authorities to spend. In many ways, China saved the world. As the American economy starts to show evidence of late cycle behavior, a recession is sure to follow some time in the future. Can China save the world again? That perfect environment to sustain broad market gains -- when global growth is fast enough to lift corporate profits, but tame enough to keep inflation muted -- should be in effect for at least another 12 months, according to Kevin Gaynor, the head of international economics at Nomura Holdings Inc. Numerous readings indicate that any semblance of investor fear has gone out the window. 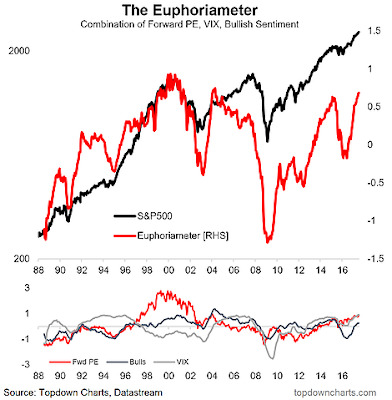 An update of the Euphoriameter.from Callum Thomas shows that it has reached a new recovery high for this market cycle. There are plenty of other examples of fearlessness. The full post can be found at our new site here. Mid-week market update: You can tell a lot about the tone of the tape by how it reacts to news. There is growing evidence that the stock market is becoming immune to good news, which is a signal of bullish exhaustion. 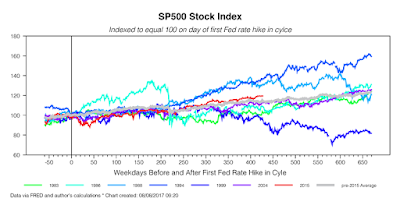 In all likelihood, the near-term path of least resistance for stock prices is down. 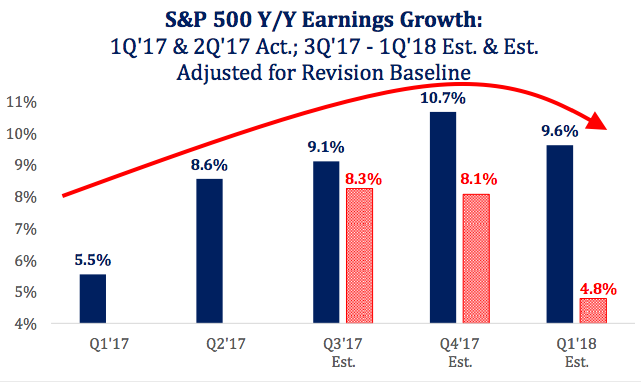 The results from Q2 Earnings Season has been stellar. Experienced investors know that corporate management is plays the "beat the earnings" game well. According to FactSet, the average 5-year EPS beat rate is 68%. On the other hand, it's harder to play accounting game with sales, as the average 5-year sales beat rate is only 53%. 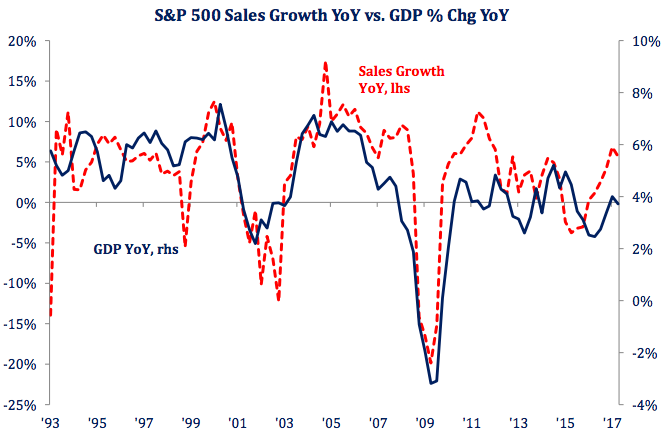 This quarter, sales beat rates are off the charts when compared to their historical experience. 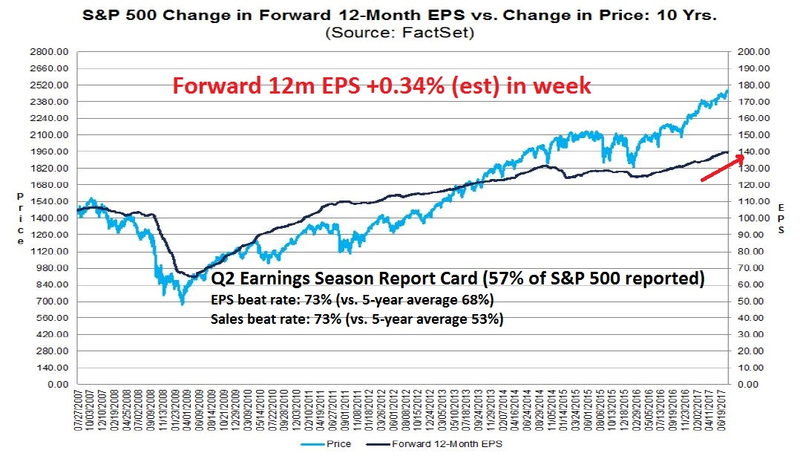 FactSet's update of earnings from last Friday shows that forward EPS is being revised upwards as well. That should be good news for stock prices. Instead, the SPX has been mired in a narrow trading range and it has been unable to stage an upside breakout to new highs. The lack of a bullish impulse in response to positive news is a warning for the bulls.